Carpentry is defined as being the trade of cutting and joining timber in order to construct buildings or other structures. Woodworking is defined as the crafts of carpentry, cabinet-making, and related skills of making things from wood. Joinery is defined as frame and panel construction, or, alternatively, as the work of the joiner — the fabrication and installation of fittings in buildings. End of blog post. Have a great day! Just kidding, we at The DIY Joint would never be so abrupt! Today’s post is dedicated to understanding the subtle differences between each of these crafts. To the layperson who might be searching a “carpentry class in NYC,” or a “joinery course NJ,” they might really be intending to find woodworking classes in NY, or they might be looking for something else altogether. It’s not our role to discriminate between the two, especially because woodworking beginners don’t typically have the technical knowledge to understand the differences — that’s why they are searching for us, after all. That being said, we offer a variety of NY woodworking classes for beginners to experienced woodworkers. We have our own open studio in Hoboken, NJ, a host of woodworking and power tools, and experienced instructors who can help folks of any skill level improve their craft while getting inspired. Our mission is to empower our students with the skills, tools, and space to make something awesome, as you might have seen on our home page. You might have also found the quote that it isn’t about what you make, it is about the satisfaction of doing it yourself. For people in New Jersey or New York who are looking to try their hand at something new, perhaps to challenge yourself or get in touch with a different part of your identity, we can’t encourage you enough to try out our woodworking courses at The DIY Joint. The reason that we started The DIY Joint in the first place was to create a space for people who were looking to get in touch with something we have largely lost as a society – making something with our hands. The tactile intimacy. The physical struggle that’s so challenging in the moment. The pure pride of conquering your doubts and making something physically, beautiful, and useful in the process. We are creators at heart. And we don’t want to spend too much time blabbing about society, technology, millennials, our woes, and such, so we’ll just leave it at that for now. We digress, as we have a promised blog topic to get to! 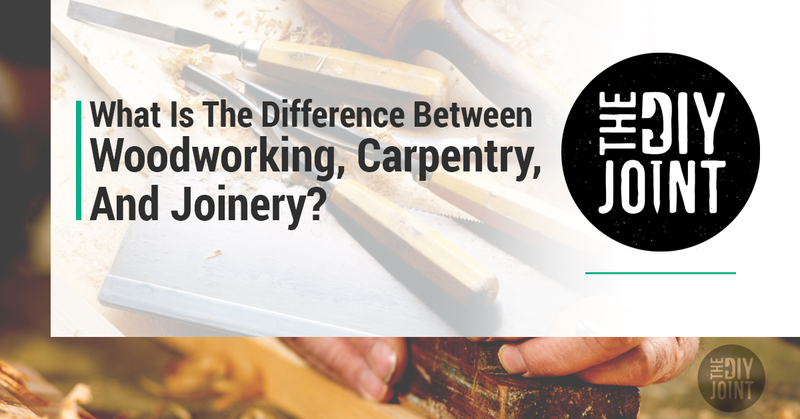 Keep reading if you are interested in actually diving into learn the differences between joinery, carpentry, and woodworking in a more thorough way. Let’s get practical and hypothetical at the same time. Suppose you need some construction work done, and you know your aren’t looking for a woodworker, but you don’t know whether you should be looking for a joiner or a carpenter for this construction project. Are they interchangeable? In the more modern sense these crafts, joiners typically make the timber products in their own shop, whereas carpenters take those timber products and use them on site. For example, a joiner might construct a special door for a shed in their own shop, whereas a carpenter would be constructing the entire shed on location. The carpenter would install the door that the joiner has made so it fits in with the rest of the project appropriately. Carpentry can sometimes include more construction-based aspects in order to finish a project, which might include joisted floors, stud-work, and the like. If you are trying to decide between the two options for a particular project you have in mind, just go with who is highly recommended and then base your decision off their experience with similar projects. In reality, there is a lot of crossover between the two terms in day-to-day operations. Did you think we forgot about woodworking in this side-by-side comparison? We would never! However, there are many forms of woodworking. We take a look at each type below. Carvers – Carvers typically work in free-standing forms in addition to working on flat surfaces. They are artists, and woodworking is their medium. Framers – Framers aren’t typically considered artists, as their function lies in building the roof, floors, and/or walls of a structure. There isn’t too much room for creative license when it comes to the structural integrity of a home. Luthiers – Luthiers make musical instruments from wood. That’s neat. Furniture makers – This could be you! That is, if you feel like taking our Introduction to Furniture Making Class. More to the point, furniture makers are sometimes included in the cabinet-making category. This can include rocking chairs, desks, tables, cabinets, etc. Turners – Turners are a specialized group of woodworkers who are adept in working on the lathe. They make bowls, dishes, and all sorts of turned items. Whittlers – These are folks, usually amateurs or hobbyists, who chip carve small objects out of wood. The very best can make impressive objects, among which are chains, book rests, containers, and all kinds of little trinkets. At the end of the day, here’s what you need to remember: carpenters fit floors, staircases, fix window frames, and install shelving, cupboards, and the like. Joiners can build stairs on site, but typically make doors, window frames, and unfitted furniture in their own shop as opposed to on site. There is some passive crossover when people throw these words around somewhat loosely. We don’t mind, as long as people find what they are looking for at The DIY Joint. We offer people looking to start a new hobby the chance to get in touch with a new side of themselves. But beyond that, you’ll be able to take something home which has purpose and beauty. It’s up to you whether you want to gift it away or present your work as a trophy of sorts in your own home. Whichever you choose, view our woodworking class schedule here and sign up soon! Spots are going fast this spring.